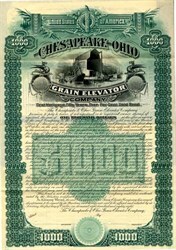 Beautiful engraved RARE specimen certificate from the Chesapeake and Ohio Grain Elevator Company . This historic document was printed by Franklin Bank Note Company and has an ornate border around it with a vignette of a ship next to the company plant. This item is over 119 years old. 100 coupons attached on top. Collis Potter Huntington (1821-1900), a successful merchant and railroad investor, had acquired the Chesapeake & Ohio Railway Company in 1869, became its President and extended its line under charters from Huntington, West Virginia to Memphis, Tennessee. He founded the town of Newport News, Virginia as its deep-water terminus. 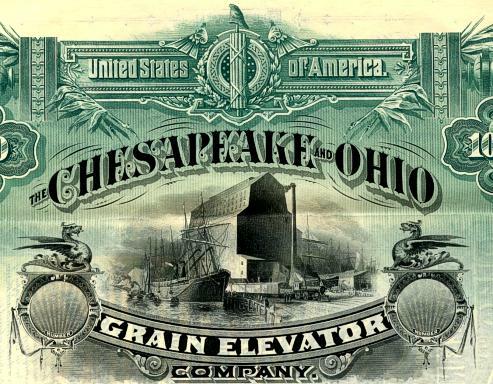 The Chesapeake and Ohio Grain Elevator Company, incorporated in New Jersey in 1882, built a grain elevator and warehouse in Newport News. The grain elevator was destroyed by fire in 1915.